The route we chose to head for Husacaran National Park was through the Cañon del Pato, a narrow road that used to have a bad reputation. It has a lot of tunnels, it is wide enough only for one car in certain parts, but if driven during the day is pretty scenic and exciting. We made it to the small town of Caraz where we spent our first night. Huascaran NP is located in the Callejon de Hualyas, which stretches for 150 km in the Ancash Region of Peru. The Santa river runs along the valley floor in a north-westerly direction. The valley's southern extreme begins at 4,000 m above sea level, and descends to 2,000m at its northern end past the city of Caraz where the Santa River leaves the valley. 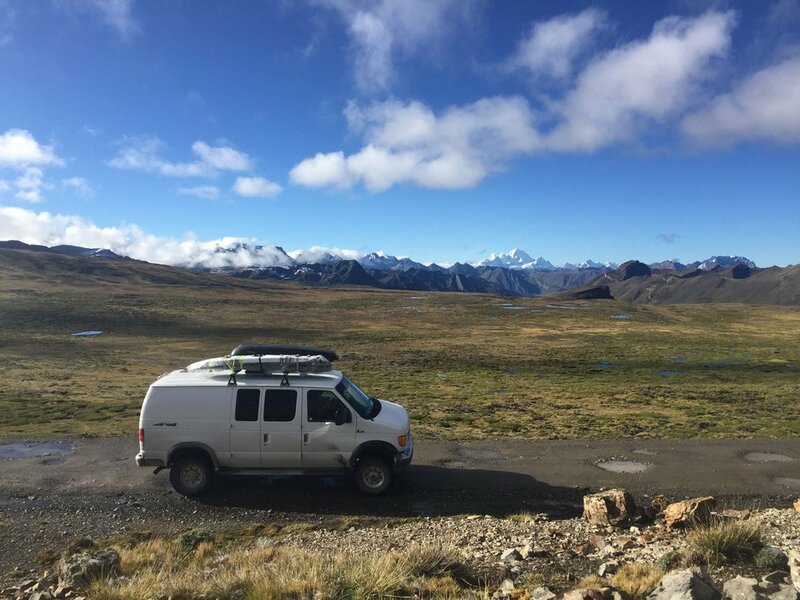 It is bordered by two mountain ranges, the snow-covered Cordillera Blanca (White Mountain Range) to the east, where many climbable peaks boast year-round snow above 5,000 m, and the Cordillera Negra (Black Mountain Range) to the west, reaching over 4,000 m but typically getting no snow as it is exposed to warm coastal winds on its western flank. These were the biggest mountains we had seen so far, our minds were about to get blown away with our first visit to Laguna Paron, with the view of one of the most perfect mountains I have ever seen: Artesonraju. 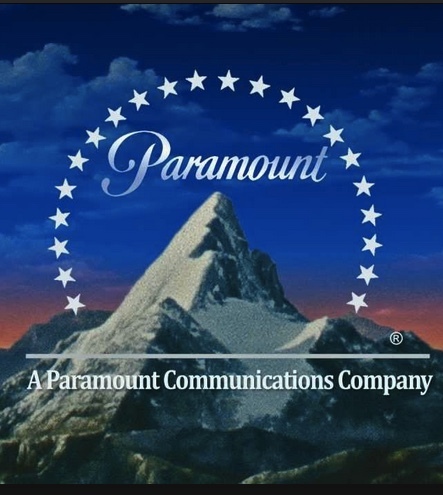 Little known factor is that Paramount Pictures logo is inspired on this view from Lake Paron, pay attention next time you see it. We spent 2 nights parked at the ranger station, which not a lot of people do, so we were lucky enough to see the many moods of the Lake, light, clouds, rain or snow affect the views a lot. The drive through the valley has beautiful views, the towns are small but very picturesque with interesting markets. 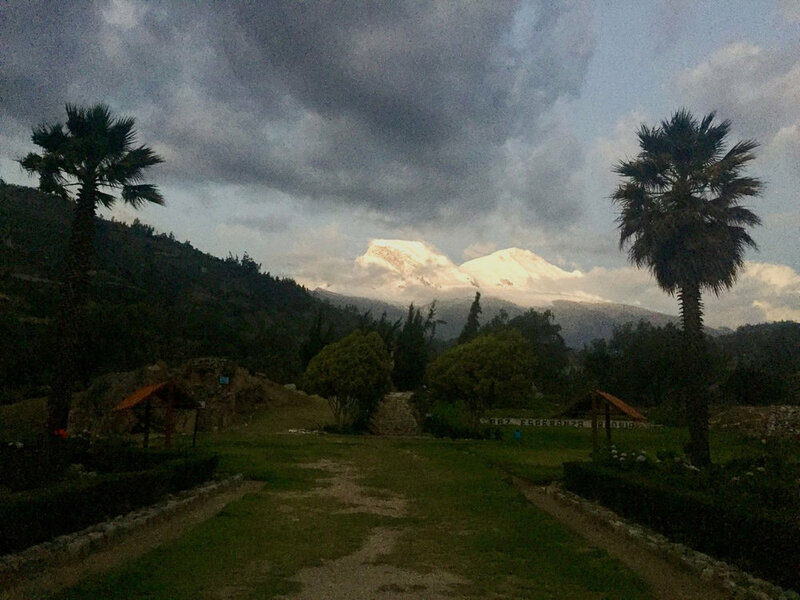 We stopped in Yungay for one night. I have heard about this town since I was a kid, it is famous for its views of the giant Huascaran Mountain and also cause it was buried by a landslide that came from the same mountain. On May 31st, 1970 a landslide caused by an earthquake buried the town of Yungay, killing 25,000 people, only 92 people survived, most of whom were in the cemetery and stadium at the time of the earthquake. We visited the memorial, it was a very sad scene, entire families died as it was a Sunday, and it’s common to get together at the grandparents house on that day. The gravestones were put where approximately the houses of the deceased were. Our next stop was Lagunas de Yanganucos. We wanted to hike to Laguna 69, 16kms there and back with 1000m altitude gain. Our day started later than planned so we end up hiking with all the tour groups. But traveling in a van gives us a unique freedom, so we were able to stay longer and enjoy some alone time by the lake, come back to the van at dark, make dinner and go to bed. We left Lake 69 tired and happy. We had not hiked at 4000m over sea level since Colombia, and it felt great to be back in the Andes. To see high white peaks, turquoise lakes, drink glacier water and breathe the cold air of the mountains totally renewed our energy. 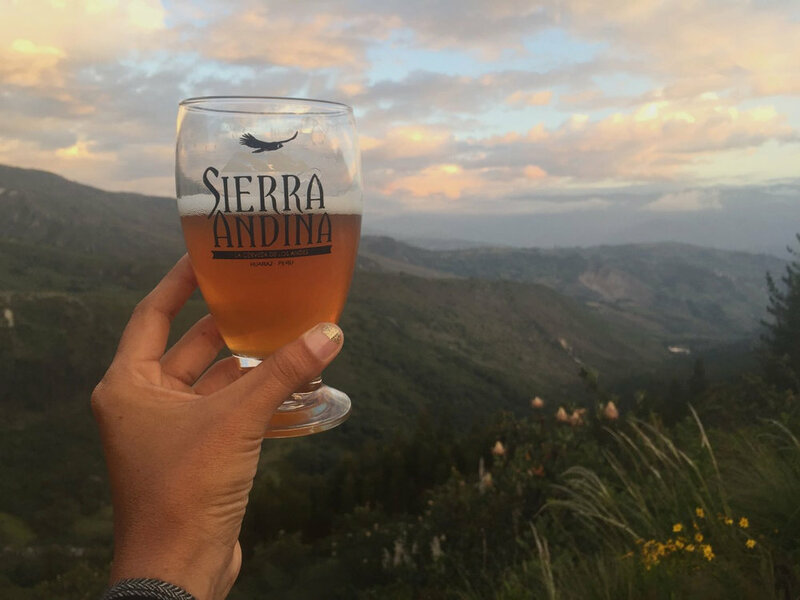 Huaraz is the big town in the area, it is not pretty but you can find anything you need there, restaurants, artisan beer joints, tour guides. I found an old childhood friend who I hadn’t seen since high school. My friend Ken and his family moved from Lima to Huaraz a long time ago, they opened an hotel in the outskirts of town and invited us to stay with them for a couple nights. Music was played, showers were taken, a lot of catch up, and we had a very merry time, it was like the 20 years we didn’t know much about each other didn’t really mattered. We said good bye and kept rolling, feeling the warmth in our hearts of the love of true friendship. The last part of Parque Nacional Husacaran had us going over a mountain pass at 5000m over sea level. Our timing was great and terrible, sunset views at that altitude were spectacular but inevitably the night came upon us and we had to stop for the night. Have you ever tried sleeping at that altitude? By this time we were acclimatized but this was way higher than planned. It was a tough night, we barely slept and it was freezing, but the views in the early morning were well worth it. Nevado Pastoruri is an agonizing snow cap, with a receding glacier with the same name. The path around it is now called the ‘Climate Change Path’ and it shows how fast it is decreasing in size. Somehow we managed to be at this site super early and by default alone. I had heard about this touristic site all my life, I remember friends saying they could come snowboard here, it was an eye opening scene. Sites like this one are the ones that really show us what is happening with climate change, how serious it is. The real, tangible consequences that we can’t see while living in cities are very clear in nature. And if we care we must take action. The drive out of the park took us into an area where one of the tallest plants in the Andes grows, the Puya de Raimondi or ‘Queen of the Andes’. The sight of this rare giant was a great surprise, it reminded us of how small we are compared to the greatness of Nature, how nothing man made could ever be better, compared to the perfection we can find in Planet Earth.